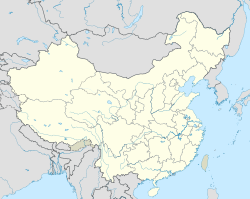 For ither uises, see Dongguan (disambiguation). 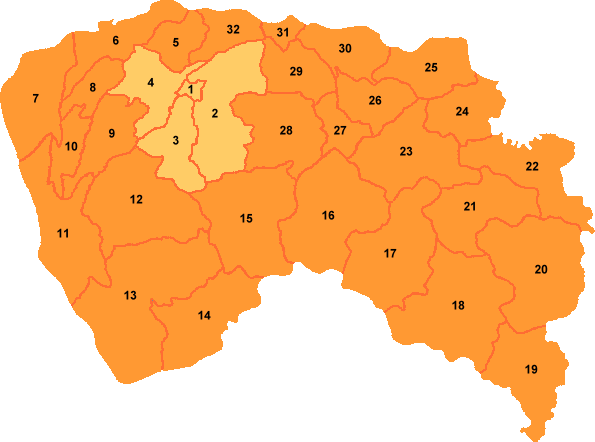 Dōngguǎn (Cheenese: 东莞), is a prefectur-level ceety in central Guangdong province, Fowkrepublic o Cheenae. An important industrial ceety locatit in the Pearl River Delta, Dongguan borders the provincial caipital o Guangzhou tae the north, Huizhou tae the northeast, Shenzhen tae the sooth, an the Pearl River tae the wast. It is hame tae ane o the warld's lairgest, tho maistly empty, shoppin maw an aw, New South China Mall. Ceety admeenistration is considered especially progressive in seekin foreign direct investment. 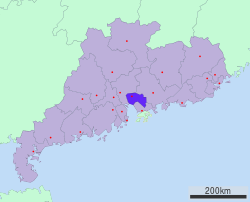 The three neebourin municipalities o Guangzhou, Dongguan, an Shenzhen are hame tae ower 25 million residents, accoontin for a lairge proportion o the Pearl River Delta Region's population. Dongguan ranks ahint anerlie Shenzhen, Shanghai an Suzhou in exports amang Cheenese ceeties, wi $65.54 billion in shipments. Awtho the earliest traces o human habitation in the aurie stretch back 5,000 years, Dongguan's emergence as a true ceety is a recent phenonomenon. In 1839, at the ootset o the First Opium War, lairge quantities o seizit opium wur burned in the local toun o Humen. Several o the major battles o the war wur focht here in this aurie. Durin the Seicont Warld War, the ceety servit as the base for guerilla resistance against the Japanese occupation. The urban centre o Dongguan is 50 km awa frae that o Guangzhou tae its north, 90 km awa frae Shenzhen tae its sooth, 47 nautical miles (87 km) awa frae Hong Kong an 48 nautical miles (89 km) frae Macau bi watterwa. Dongguan is a must-pass-bi locality frae Guangzhou tae Hong Kong bi road or watterwey. O the total aurie o Dongguan, 27% is watter, 25% forest laund, an 13% ploughed laund, while 35% o its laund aurie haes been fully developit. The climate o Dongguan is humid subtropical. It lees juist sooth o the Tropic o Cancer. The average temperatur is 22.8 °C (73.0 °F) throuoot the year. The average rainfaw is 1,756.8 millimetres (69.17 in). Dongguan haed an estimatit 6,949,800 inhabitants at the end o 2008, amang whom 1,748,700 wur local residents an 5,201,100 permanent migrants frae ither pairts o the kintra. At the 2010 Census the population haed reacht 8,220,237. Dongguan is a kent hometown for mony owerseas Cheenese an aw, the faimily oreegin o ower 700,000 fowk in Hong Kong, Taiwan an Macau an ower 200,000 naitionals livin abroad. New South China Mall: Warld's seicont lairgest maw. ↑ "Livable Dongguan". Liveable.dg.gov.cn. Retrieved 2010-05-06. ↑ "Donguan Forges Sister-city Relations With Hartford". People's Daily. Retrieved 2008-10-27. ↑ "Dongguan and Thessaloniki Formed Sisterhood (in Chinese)". City of Dongguan. Retrieved 2008-10-27. ↑ > "Dongguan and Asan Formed Sisterhood (in Chinese)". City of Dongguan. Retrieved 2013-11-19. Wikimedia Commons haes media relatit tae Dongguan. This page wis last eeditit on 11 Mairch 2018, at 05:54.